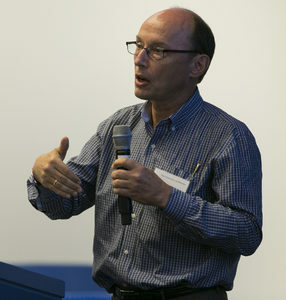 Leslie Greengard speaks at a Simons Collaboration on the Global Brain meeting in 2015. Leslie Greengard, founding director of the Simons Center for Data Analysis (SCDA), was elected to the American Academy of Arts and Sciences on April 20. Four Simons Foundation grantees were also elected: Hirosi Ooguri of the California Institute of Technology, Andrei Okounkov of Columbia University, Steven R. White of the University of California, Irvine and Bryna Kra of Northwestern University. The academy is among the nation’s most prestigious honorary societies and a leading center for independent policy research. It aims to advance science, engineering and innovation throughout the world for the benefit of all people. Greengard, a member of the National Academy of Sciences and the National Academy of Engineering, is highly regarded for his contributions to the fields of scientific computing, data analysis and integral equations. One of his most significant scientific achievements arose from his collaboration with Vladimir Rokhlin (also elected as an academy fellow this year). Together, they developed the fast multipole method, or FMM, a mathematical technique with an enormous range of applications, including chip simulation and molecular modeling. In 2000, the Institute of Electrical and Electronics Engineers recognized FMM as one of the top 10 algorithms of the 20th century, and in 2001, Greengard and Rokhlin received the Steele Prize for Seminal Contribution to Research from the American Mathematical Society for their work. Greengard joined the Simons Foundation in 2013 as founder and director of SCDA. The center’s primary mission is to create new computational frameworks that will enable scientists to analyze the large and complex datasets that are being generated by new experimental technologies. Hirosi Ooguri, a mathematical physicist and string theorist at the California Institute of Technology, works on Calabi-Yau manifolds and has provided important new insights into the D-brane structures crucial to string theory, along with advances in understanding the relationship of supersymmetric gauge theories to string theory and to gravity. He is perhaps best known for his innovations in the use of topological string theory to compute Feynman diagrams in superstring models. Ooguri was named a Simons Investigator in 2012. Andrei Okounkov, a mathematician at Columbia University, works on a wide range of topics at the interface of representation theory, algebraic geometry, combinatorics and mathematical physics. He has made major contributions to the enumerative geometry of curves and sheaves and the theory of random surfaces and random matrices. He was named a Simons Investigator in 2014. Steven R. White is a physicist at the University of California, Irvine and one of the directors of the Simons Collaboration on the Many Electron Problem. He works mostly in condensed matter theory, specializing in computational techniques for strongly correlated systems. He is also the inventor of the density matrix renormalization group (DMRG), one of the most important and widely used algorithms for simulating quantum systems. Bryna Kra is a mathematician at Northwestern University. Her work focuses on ergodic theory and dynamical systems and uses dynamical methods to investigate problems in combinatorics and number theory. She was named a Simons Fellow in 2016.